It is billed as somewhere between economic suicide and armageddon. The government’s own studies predict massive disruption. An overwhelming majority of parliamentarians are opposed. 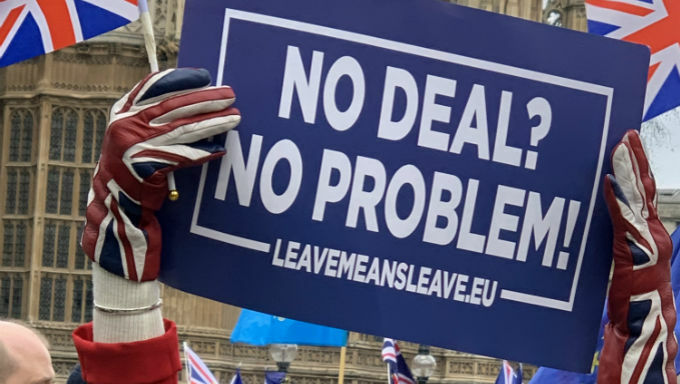 Yet plenty of punters are backing a No Deal Brexit and, according to the latest ICM poll, it is the preferred outcome of 28% of UK voters - more than any other option on the table. Whatever your prediction, be sure to shop around and check each bookie’s rules during this incredibly complex process. There are some big differentials. For example Paddy Power yesterday shortened their odds about the UK leaving on 29/03/19 without the Withdrawal Agreement in place from 3/1 to 5/2, with 1/4 available about the alternative. William Hill have a four-way market regarding the status on 29/03/19. They bet 4/6 that Article 50 will be extended; 5/2 Leave with a deal; 7/2 Leave without a deal, 14/1 Article 50 revoked. So how should we play it? As it stands, the UK is headed for that No Deal exit on 29/03/19. Preventing it will require the government to act. A definitive solution is not going to materialise just yet so expect the panic level to rise. What Happens Next in Parliament? May is going to persist with her deal and there are some positive signs. Brexiter rebels are openly talking about reluctantly backing it, lest their wider project is foiled. To reverse a 230 vote loss, however, would require many more switchers or, more plausibly, abstentions. Meanwhile the key backbench amendments are being tabled and due to be debated following the second vote on her deal. One from Yvette Cooper - tipped at 25-1 recently to be Next Labour Leader - seeks to demand the government extends Article 50 if the deal isn’t passed by late February. Others, most notably from Dominic Grieve, seek to enable backbenchers to take control of the process, holding indicative votes on various plans and tabling legislation. There is every reason to believe these will pass. If so, one would assume it is the end for No Deal and under normal rules, Theresa May’s premiership. Conventional wisdom says that, whatever their rhetoric and positioning, governments don’t risk chaos or destroying their economies. That when the overwhelming majority of MPs agree something is bad, they will prevent it. That Prime Ministers can’t survive losing votes on their flagship legislation or being usurped by backbenchers. The nagging doubt, of course, is that these are not normal times. Conventional wisdom said a late swing to the status quo would deny Brexit in the 2016 referendum. That a reality star with zero political experience and countless skeletons in the public domain couldn’t win the Republican nomination - let alone the presidency of the USA. Conventional wisdom also said that a Labour Party, led by Jeremy Corbyn and trailing by over 20% six weeks out, would be thrashed at the 2017 general election. On each occasion, bookies and pundits were stunned. No wonder gamblers are prepared to back another earthquake. If you believe Theresa May that the UK will leave on time, take the 7/2 with William Hill about No Deal rather than shorter odds involving a deal. It is the only way I can see the date not being extended. The only alternative is for MPs to back her deal but the timeframe to ratify it in both UK and European Parliaments is wafer-thin. Brexit would be delayed for a few weeks, perhaps until after the summer following EU elections. I am not, however, advising a bet on No Deal. First, even this scenario is not guaranteed to take place on 29th March. Never underestimate the EU’s ability to cobble together a last-minute, temporary compromise. There could well be a transition period rather than moving onto WTO terms in order to avoid chaos. Second, everything could kick off next week. I expect some of these amendments to pass and create an unprecedented constitutional crisis. It could finally force May from office. Michael Gove put in a blatant audition for the job last week and is very well positioned to succeed. Alternatively, May could call an election. MPs could vote on alternatives and choose a second referendum, or a renegotiation that would take months. Gordon Brown suggests an interesting proposal for Citizens Assemblies - after extending Article 50 for a year. The one outcome that doesn’t appear plausible is the smooth and speedy assent of the Withdrawal Agreement. It could still pass, for sure, but not in time to complete Brexit by the end of March. Regardless of those alternative scenarios, which may develop in due course, MPs will soon face a straight choice. Either extend Article 50 or No Deal. Take 4/6 about the former with William Hill - a good price about conventional wisdom being proved right, even in these unpredictable times.